There’s less than a week until the start of the 2016 Iowa State Fair. This major event draws more than a million people to the East side of Des Moines. With approximately 100,000 people passing through their gates each day and relatively tiny number of armed security personnel the Iowa State Fair is also Iowa’s largest gun free zone, making it an area ripe for crime and victimization. Last week a panel of Iowa lawmakers reviewed the Iowa State Fair’s gun free zone policy, but decided to take no action to overturn the ban. Speaker after speaker testified against your right to defend yourself and to protect your loved ones. The Iowa Firearms Coalition was the only pro-Second Amendment organization to testify in favor of repealing the Iowa State Fair’s ban on the lawful carry of firearms. Our testimony is on the website, and so is a perfect example of why you should be able to carry at the Iowa State Fair. The Iowa Legislature’s Administrative Rules Review Committee may have decided against taking any action but that does not mean the issue of State Fair Carry is dead. We expect to see this brought up during the 2017 legislative session. 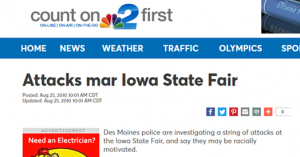 In all honesty though, unless we can flip the Iowa Senate repealing the Iowa State Fair gun ban will be tough. Not impossible, but tough. As will passing laws like Stand Your Ground, Constitutional Carry, or repealing Iowa’s ban on supervised youth handgun shooting. That’s why it’s imperative that you get involved this election cycle and do more than vote. We’re working extremely hard to flip the Senate, but we need your help. Our campaign and election division, IFC-PAC, is mobilizing Iowans around the state to end the Gronstalling in the Iowa Senate and pave the way for the a legislature that is committed to protecting and enhancing the Second Amendment. When you’re ready to go to work for the Second Amendment sign-up to volunteer with IFC-PAC or make a donation to help us flip the Iowa Senate! Finally, we’re very excited to announce that Jack of West Chester was the winner of our July AR15 Upgrade Giveaway. Jack won an 13” Geissele Automatics rail and ALG Defense ACT trigger for his AR15. This month we’ve partnered with Vortex Optics to giveaway their newest red-dot optic the SPARC AR. There are multiple ways to enter, and you can gain bonus entries for referring a friend. We’ll be giving away the Vortex SPARC AR at the end of this month, but every week we’re selecting a random winner and mailing them small prize from our IFC swag bag. More updates to come. Thank you for continuing to support the Iowa Firearms Coalition! Federal Gun Control Votes Pending! 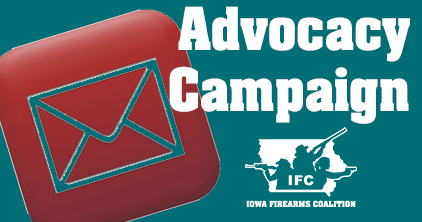 Rather than fill your inbox with Chicken Little “the sky is falling, we need you to send money now” emails (like some other gun owners) the Iowa Firearms Coalition works hard to provide you with honest information about what’s going on on the Second Amendment front in Iowa. We’re not alarmists, but right now it’s time to sound the alarm. Anti-gunners are using the tragedy in Orlando to push a coordinated attack to try to ramrod through gun control measures at the state and federal level. Now is the time for action. Nationally, gun control votes are scheduled in the U.S. Senate tomorrow (6/20). If you haven’t already, you need to reach out your elected officials right now and make sure they know Iowans do not support these gun control schemes. Our Advocacy Campaign makes it ridiculously easy to make your voice heard. Please help spread the word. Unfortunately, McCoy is not up for reelection this November, so he’s free to introduce the his ban bill in the Senate. We’d all like to think it would die the same way our Stand Your Ground, Constitutional Carry, Youth Shooting and so many other pro-gun owner bills have been killed over the years, but considering the make-up the Iowa Senate that’s hardly guaranteed.